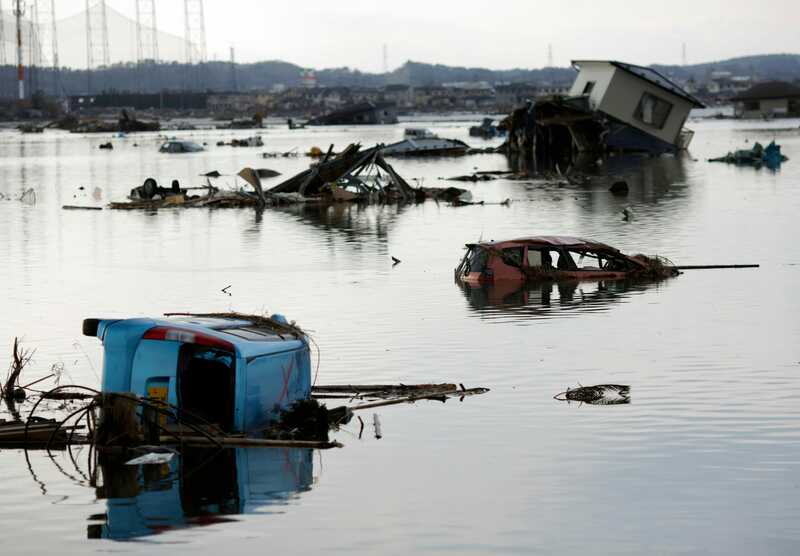 Thirty billion dollars in funding for roads, bridges and thousands of new homes in areas devastated by the tsunami in Japan three and a half years ago is still languishing unspent in the bank. That means Keiko Abe is heading into a fourth winter of sub-zero temperatures in a cramped, temporary dwelling that is succumbing to the elements. “I’m just clenching my teeth until I can move out and live like a human being again,” says Abe, 66, as she stands in the dim light of her living room with enough space for a couch, table and television. 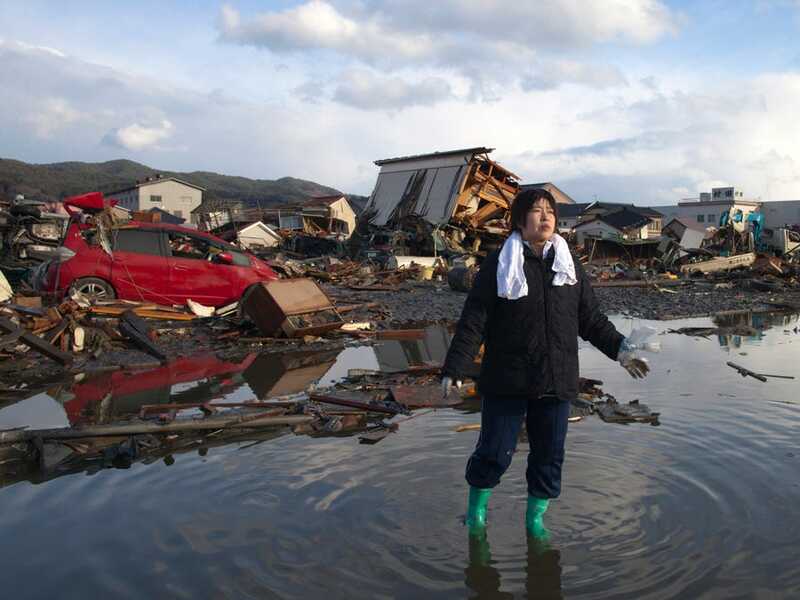 A grey mould clings to some walls of the prefab structure, where Abe has lived with her husband since shortly after a 9-metre (30 feet) wall of water obliterated large swathes of the city of Ishinomaki on the afternoon of March 11, 2011. Japanese government funds budgeted for reconstruction and transferred to local governments are stuck in banks across the tsunami-ravaged northeast, a Reuters review of budget and bank deposit data and interviews with bank officials reveals. The central government has paid out more than $US50 billion directly to local governments in Miyagi, Iwate and Fukushima prefectures, the areas hardest hit by the disaster. But about 60 per cent of that money remains on deposit in the region’s banks. Ishinomaki, where more than 3,700 people died in the tsunami — the most casualties of any city in the disaster — has been deeply affected by the funding paralysis. 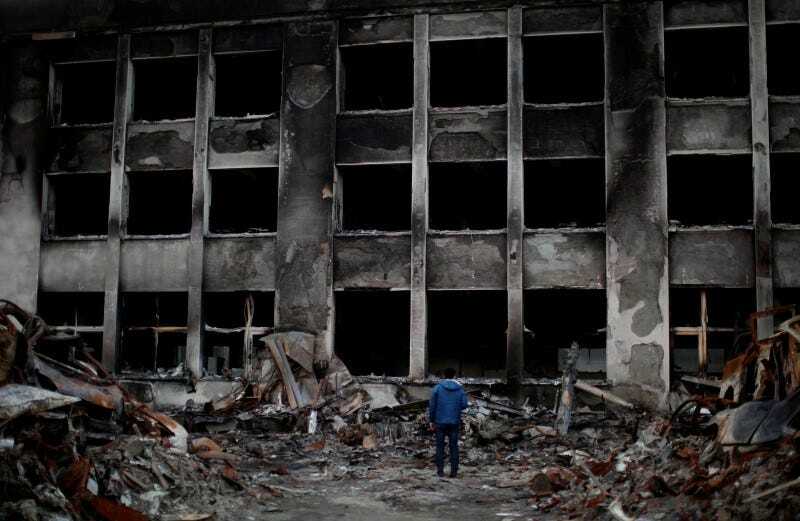 The port city, where 56,000 buildings were damaged, has been showered with money for reconstruction — about $US4.1 billion in the three years after it was hit. But almost 60 per cent of the money, or $US2.3 billion, remains in bank deposits. And fewer than five per cent of the planned new homes for the city’s nearly 25,000 evacuees have been completed. For Prime Minister Shinzo Abe, the reconstruction delays are a potential time bomb. Before he became prime minister in December 2012, Abe campaigned in parliamentary elections on a pledge to speed up reconstruction — a promise he has repeated on both anniversaries of the disaster since he took office. As opposition leader he chided the government for not moving fast enough on rebuilding: “Japan has no future without reconstruction of disaster-hit areas,” he declared during a tour of Fukushima, where the tsunami crippled a nuclear plant. So far, about 2,700 housing units of a planned 29,000 have been completed in the tsunami-hit areas. In its housing plan issued more than a year ago, the government said it aimed to complete 15,000 homes by March next year. It has since scaled back that target to 10,000 units. A labour shortage exacerbated by the siphoning of workers away from the disaster zone to build commercial facilities for the 2020 Tokyo Olympic Games has slowed reconstruction. So have a spike in the cost of building materials and problems in procuring land in the disaster zone. Initial government estimates for the cost of building a new home have been far off the mark. In 2011, the Reconstruction Agency budgeted $US158,000 for a new home. In April, it revised that estimate upward, for a second time, to $US217,000 — almost 40 per cent higher than the original figure. Carlos Barria/ReutersA house and vehicles damaged by the March 11 earthquake and tsunami are seen in Ishinomaki, northern Japan March 31, 2011. Much of the reconstruction cash has ended up on the ledger of 77 Bank in Sendai, some 50 kilometers (30 miles) west of Ishinomaki. Government deposits at 77 Bank, the region’s largest lender, have jumped four-fold to almost $US17 billion in the past three years as reconstruction money flooded in, the bank said. Yoshikazu Onodera, a 77 Bank executive, said the rapid inflow of deposits has been a challenge for the bank to manage since the money could be withdrawn on short notice. The solution, said Onodera, has been to invest in short-term government bonds. As a result, 77 Bank’s government bond holdings have risen two and a half times to $US20 billion since 2011. Like 77 Bank, other regional lenders have also plowed funds into Japanese government bonds, creating a closed loop of financing. By buying government bonds, the banks’ investments are essentially helping to fund the borrowing that the government undertook to make the disaster-related allocations in the first place. The central government issued $US130 billion worth of reconstruction bonds in the three years after the disaster. The unspent funds sitting in bank deposits also come at a cost to Tokyo. The government is under mounting pressure to cut a public debt load that is more than twice as large as annual economic output. 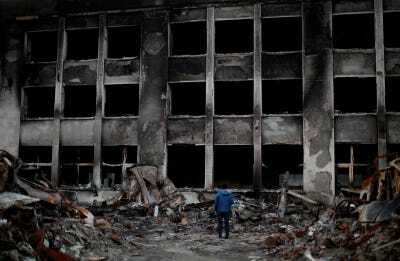 Separate from the money allocated directly to the prefectures, the central government has poured $US140 billion into disaster-relief and reconstruction projects, including emergency loans to small- and medium-sized businesses hit by the tsunami. Yomiuri Shimbun/ReutersA woman looks at the damage caused by a tsunami and an earthquake in Ishimaki City, Miyagi Prefecture, after the magnitude 8.9 earthquake struck the area March 13, 2011. In the Ishinomaki suburb of Hebita where Keiko Abe has been told her new home will be ready by spring, six workers pumped water out of a construction site on a mid-September afternoon after heavy rain had swamped the area. The foundations have been laid for some homes but there were few signs of building activity. Several cranes and trucks stood idle next to piles of sand and gravel. The government’s five-year reconstruction plan was built on unrealistic assumptions, said Yoshikiyo Shimamine, the chief economist at Dai-ichi Life Research Institute in Tokyo. “Given bottlenecks such as labour shortages and material cost rises and difficulties in getting consensus among residents who are relocated, reconstruction budgets are not something that can be spent within five years,” he said. Officials in Ishinomaki, home to 150,000 people, say spending the more than $US4 billion in reconstruction aid has proven tough. With all of the city-owned land having been designated for temporary housing after the tsunami, the local government had to negotiate the purchase of an additional 9,000 plots to build permanent homes, the reconstruction office’s Oka said. That inflated the price of a plot of land in Ishinomaki by 15 per cent last year, the biggest jump anywhere in Japan. 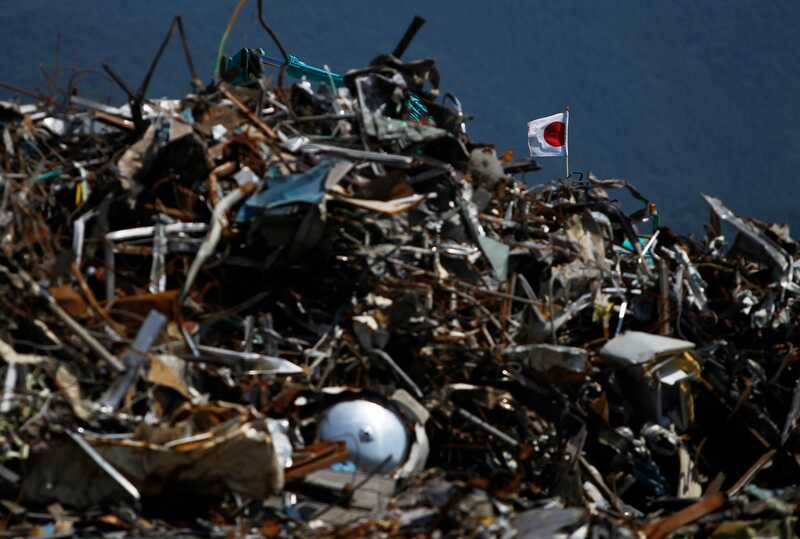 Toru Hanai/ReutersA Japanese national flag flutters near an area where debris cleaned up after from the March 11 earthquake and tsunami is being collected in Ofunato, Iwate prefecture, September 9, 2011, some six months since the disaster. Other areas have been beset by similar delays. Miyagi, the prefecture that includes Ishinomaki and Sendai, planned to build some 15,000 public housing units by March 2016. In early October it extended that deadline by two years. After the tsunami, about a third of public works projects in Miyagi failed to attract bidders in the first round as construction companies say they held back for fear the projects would be unprofitable, Miyagi prefecture officials said. That failure rate compares with just 3 per cent before the disaster. 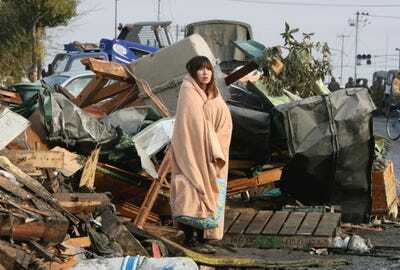 To be sure, rebuilding a city like Ishinomaki is a vast logistical undertaking. Parts of the city need to be built from scratch. 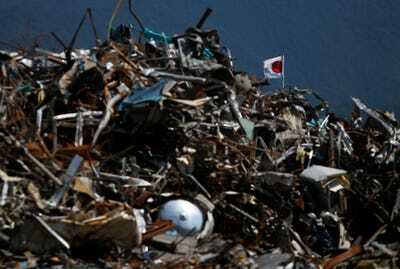 A strip of Ishinomaki’s shoreline where 6,500 homes once stood has been declared too dangerous to build on. And many local government officials, who would otherwise have played a role in reconstruction, either died in the tsunami or had their homes destroyed and are themselves living in temporary dwellings.